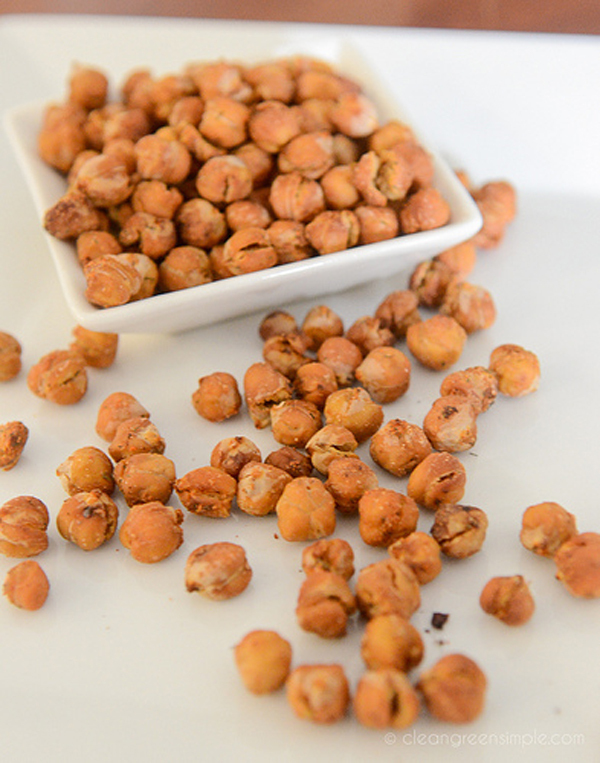 Dry-Roasted chickpeas are a crispy, crunchy and satisfying vegan snack with no added oil. Easy to make and perfectly portable! Roasted chickpeas have been all over the internet for a while now, but I never got around to trying them myself – and now that I have, I wonder why I waited so long! They are a delightfully crunchy, flavorful vegan snack, perfect for packing in a lunch or taking on a hike. 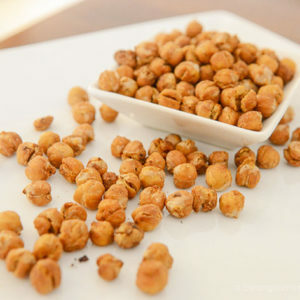 They’re also easy to make and versatile – just drain and rinse a can or two of chickpeas (it might say Garbonzo beans on the label — same thing, but in Spanish) or soak dried ones overnight, toss them with whatever flavorings you like. I used salt, garlic powder, and paprika, but you can use tons of things. Chili powder, lemon juice and dill, onion, black pepper — they go well with almost anything so it’s a lot of fun to experiment and play with various flavors. Not the most gorgeous thing in the world, but once you throw them in a little bowl they look just fine – kind of like nuts, really. 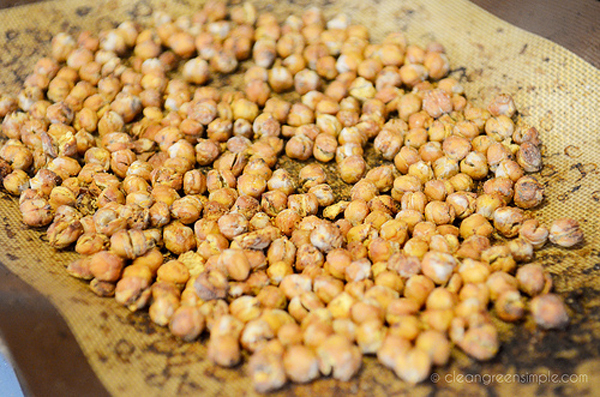 It’s amazing how the chickpeas go from soft to crunchy, they really have a satisfying crispy texture! So if you haven’t tried oven-roasted chickpeas yet, please don’t be like me and wait forever! If you have, do you have any favorite seasoning combinations I should try? Vegan, gluten free, soy free, low fat, refined sugar free Feel free to play with the seasonings and try your own variations! 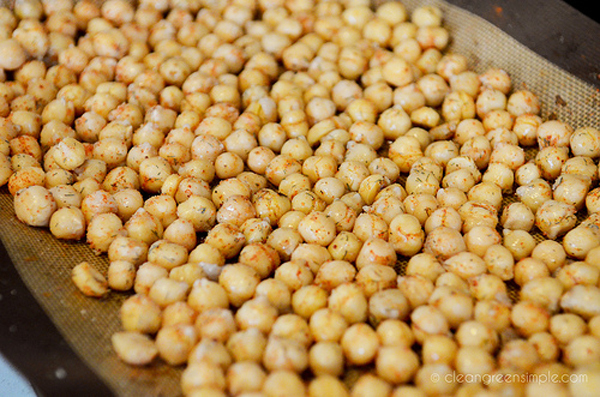 Toss chickpeas, salt, and spices together in a small bowl until the chickpeas are evenly coated. Spread chickpeas evenly on a cookie sheet and bake for anywhere from 45-60 minutes, stirring occasionally until they get hard and crunchy. 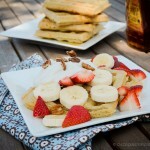 Serve immediately or allow to cool first, they are good both ways! I’ve been making these for nearly a year with various seasonings. They are a great snack for children; my 4-year-old loves them. She’s already leaning towards a vegan diet, just like her daddy! Wonder why I have never made it too! I am constantly looking for savory snack ideas and this one is perfect. looking at these chickpeas, i feel like making them soon. just that never tried making these. in india we do get roasted as well as fried chickpeas all spiced with indian masala. the roasting is on hot sand and not in the oven. I tried to make roasted chickpeas once, and they didn’t turn out so well; I will have to try again! The next time you make them you should try them with a mix of nutritional yeast, garlic powder, onion powder, and chili powder. I put this mix on popcorn and it is delicious! thanks for the recipe, we all love it! I love making roasted chickpeas. Just made my first batch and loving them! Can’t wait to try different seasonings. AWESOME! My 9-year old is going to love these too. What a terrific snack to replace popcorn, crackers, etc. So I tasted them after 40 mins on my second round of rotating them around and they were yummy! A little soft in the middle still so I put em back for the last 20 mins. Too bad the last 20 mins managed to burn them. I’m thinking slight lower cook temp or shorter cook time? 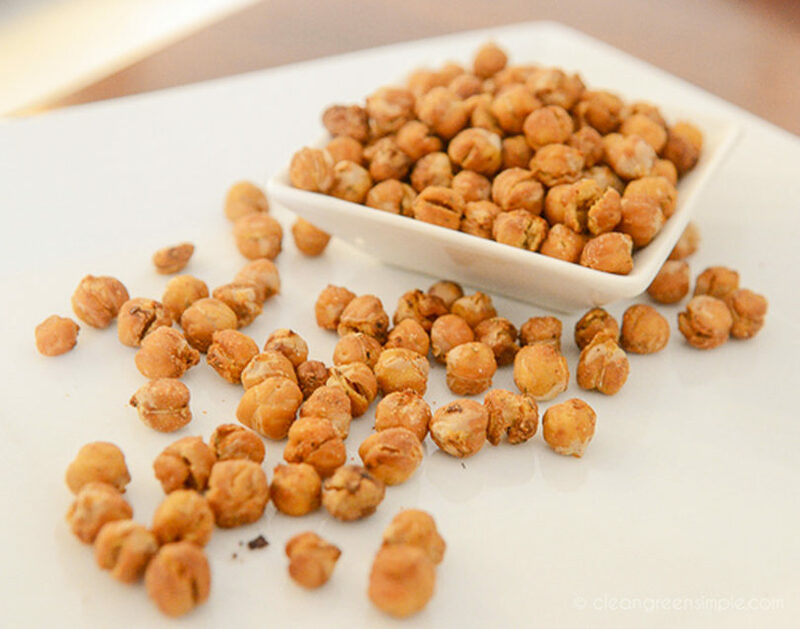 Same question – if we soak our own chickpeas, do we cook them first? Or directly bake them after soaking? Soak first, then bake once they are soft. I have to try those. They look great! These look terrific! Pinterest won’t allow me to pin your photos of the chickpeas. Is there a way you can change that so we can share the love? I’ll look into it, you should be able to share all my photos. Every time I’ve tried to roast chickpeas they don’t work! I use dry ones, straight from a packet. I soak them overnight, and then just pop them in the oven. They never work! What am I doing wrong? I tried making these last week, but couldn’t get them hard and crunchy. Even increasing the baking time the centers were still soft. Any suggestions?! Can you soak overnight and then simply roast….or do I need to boil them? I think as long as they are fully soaked and softened to the point that you would eat them raw, then that’s fine! 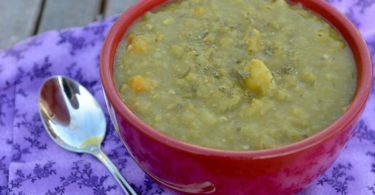 I’ve used dried, soaked and a short simmer with great results!